Pine nuts at the source. I was having a quiet breakfast on the terrace, eating fresh-picked strawberries with yogurt and savoring a cup of tea, when CRASH, a missile hit the deck right beside me, sending shrapnel in all directions. I looked skyward, into the tops of a towering pine tree on the other side of the patio wall, and, there they were, potential missiles just waiting for a strong wind to bring them down on my head. The missiles were heavy pine cones and the “shrapnel” the scattered pieces of the pine cone and the small pine nuts that exploded from it. I moved my breakfast table from under the danger zone and proceeded to gather the tiny nuts. If this looks like manna from heaven, let me hasten to tell you that pine nuts are devilishly difficult to extract. 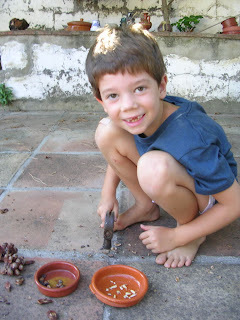 First you have to prise them out of the pine cones (yes, whacking them on the terrace floor helps), then crack each bitsy nut, hopefully without smashing the kernel in the act. My grandson Leo is much more adept at cracking pine nuts than I. The problem, though, is that he eats them as he cracks them. These are the nuts (actually, seeds) of the Mediterranean stone pine (Pinus pinea). They are long and slender compared to the smaller imported Chinese pine nuts. 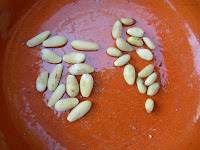 Mediterranean pine nuts on the left, Chinese on the right. A recent posting by blogger Dianne Jacob (Will Write for Food, http://diannej.com/blog/2011/07/watch-out-for-ongoing-bitter-taste-from-pine-nuts/ ) warns pine nut fanciers of the taste-altering effects of some varieties of Chinese pine nuts. 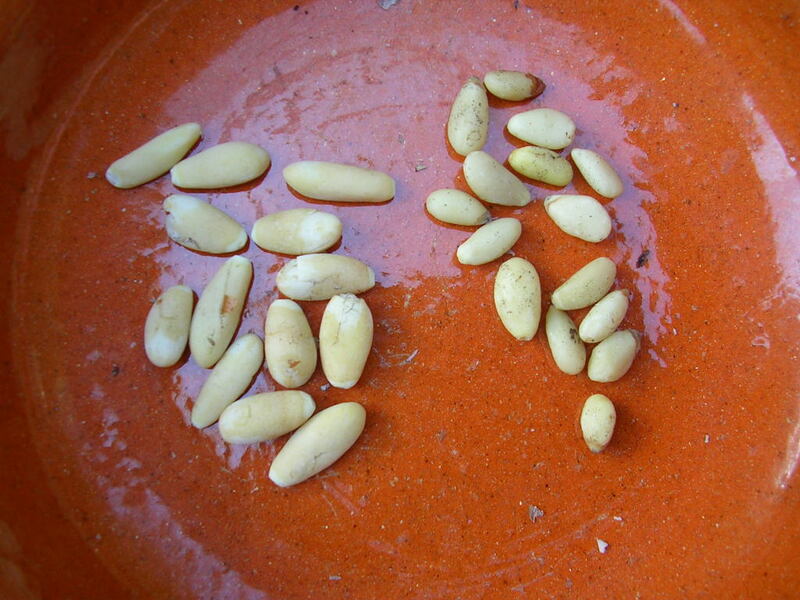 In Spain, pine nuts go into a stuffing for turkey; along with raisins, they’re tossed with chard or spinach. They adorn tiny Christmas cookies or are coated in sugar syrup. 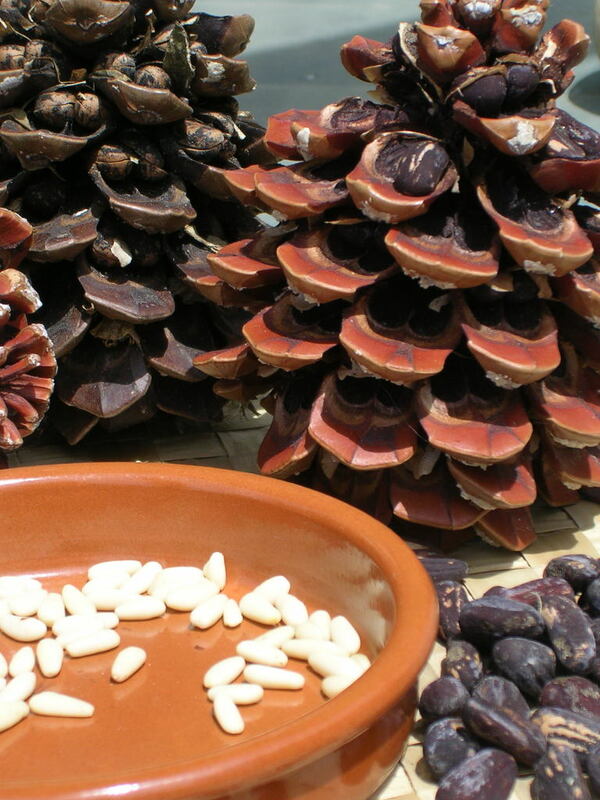 Where pine trees grow, such as in the marismas, marshlands, of the Guadalquivir River basin, pine-nuts might be used instead of almonds for white gazpacho. Or combined with clams in a tasty hot soup. 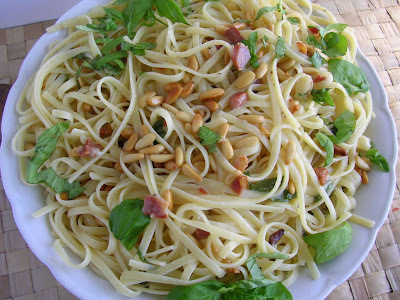 Because I also had a supply of fresh basil, I decided to use my pine nuts to make pesto, that Italian sauce for pasta. 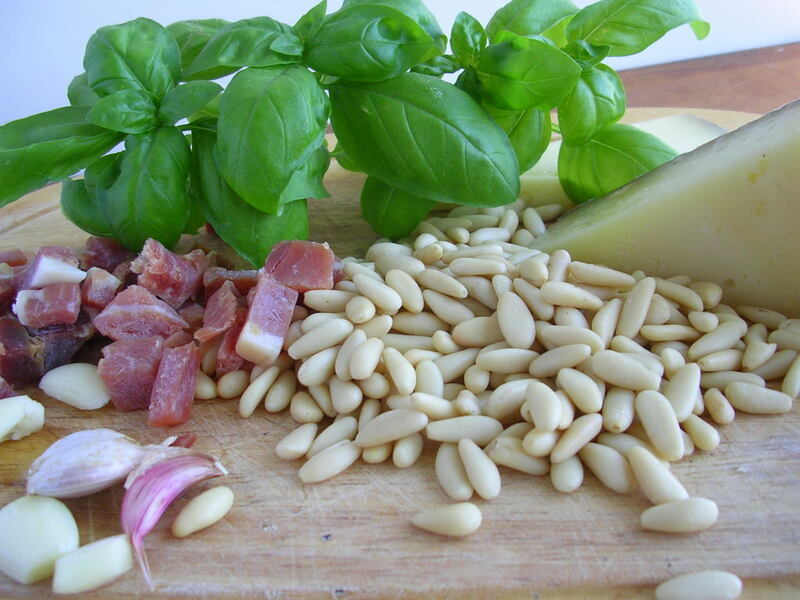 Pine nuts, garlic, ham and basil for anti-pesto. But, why mess up those delicate little pine nuts by crushing them? Instead I invented ANTI-PESTO—a quick sauté, some grated cheese (Spanish Manchego, preferably aged, instead of Parmesan), lots of fresh basil. Really easy, so fresh. Cook 1 pound of linguine or spaghetti until done to taste. While pasta is cooking, heat ¼ cup olive oil in a small skillet. 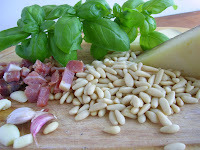 Add ½ cup (3 ounces) pine nuts, 3 cloves of garlic sliced crosswise, and ½ cup (2 ounces) chopped serrano ham. Fry until garlic and pine nuts are golden. Remove. Drain the pasta, saving some of the cooking liquid. Return the pasta to the pan. Add the pine nuts, garlic, ham and all of the oil and toss. Stir in 1 ¼ cup (3 ounces) grated Manchego cheese. Add about ½ cup of the reserved pasta water. Season with salt and freshly ground black pepper. Stir in 1 cup shredded fresh basil leaves. Serve immediately. Pasta with pine nuts, basil, ham and garlic. Not gazpacho, but cold soup with melon. There’s an old country joke, the sort of thing that you tell little kids, that watermelons are completely white inside until the very instant that you cut one open. As you insert the knife, the flesh turns deep red. Magic. So last week, a watermelon arrived from a friend’s garden that failed to work according to design. We sliced into it and—oh no!—it didn’t turn red! The flesh was white and so were the seeds. It was juicy, but not very sweet. No one wanted to eat pale watermelon. But, I couldn’t bear to throw it out. I first thought about turning it into gazpacho (the recipe for authentic gazpacho with tomatoes is here), but then remembered a Persian recipe for cold cucumber-yogurt soup. Substituting the white watermelon for cucumber, I came up with a wonderful summer soup. 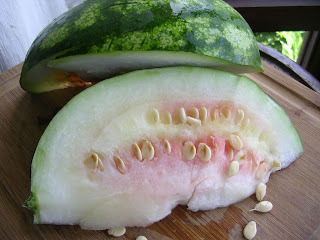 We liked it so much that I will try it with red watermelon or with not-too-sweet melon (maybe honeydew). Here’s how. Cut up enough watermelon (white or red, or honeydew melon) to make about 4 cups. Scoop out the seeds. 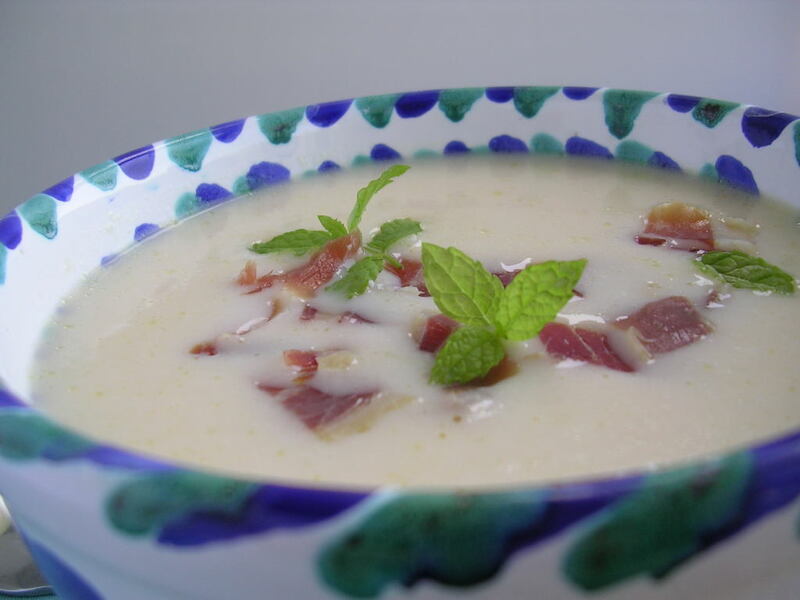 Puree the flesh with a cup of low-fat plain yogurt (Greek yogurt would be good too), a couple cloves of garlic, 3 tablespoons of extra virgin olive oil, 1 tablespoon lemon juice and salt to taste. 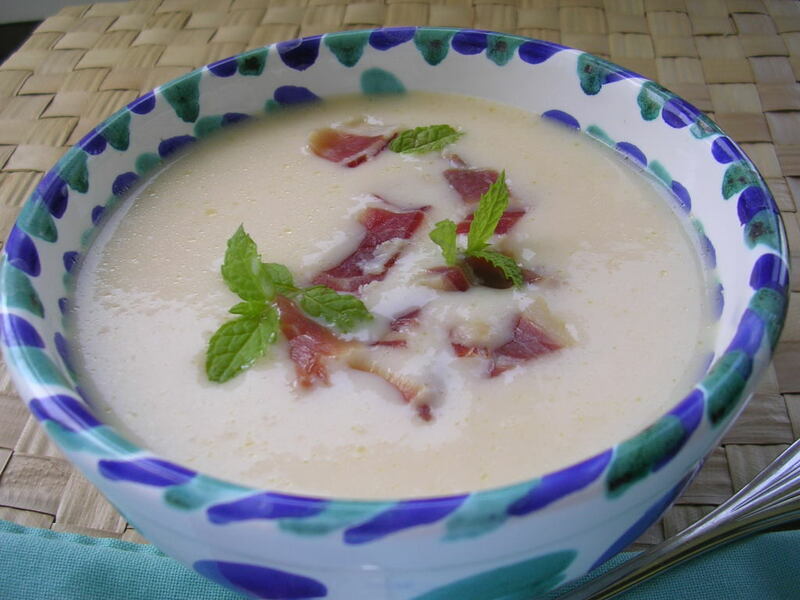 Chill the soup and serve garnished with strips of serrano ham and sprigs of mint. Watermelon soup with a garnish of serrano ham and mint. Invitations went out on Facebook a couple months ago for a big summertime get-together of expat families and their kids who grew up together in this Spanish village. Now, our kids have kids. Some still live in the village, but others are far-flung. The visit of one family from Chicago was the reason for the party. It was a terrific reunion of cousins, school friends, former teachers, parents, grandparents, neighbors. Stuffed piquillo peppers and more. 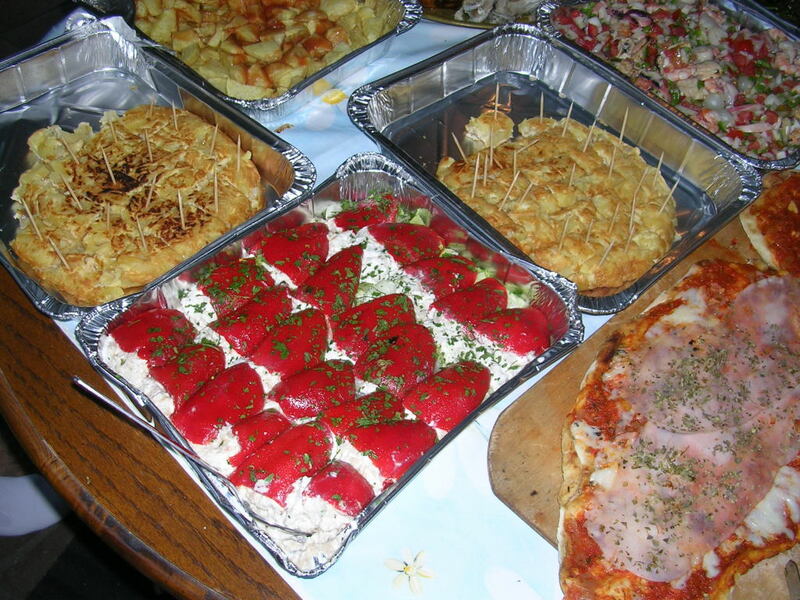 The hosts had some of the food catered by Bar Niño, a nearby tapas bar—stuffed piquillo peppers, potato tortillas, salpicón de mariscos (chopped seafood salad), fried green peppers, potato salad. Josh prepared his trademark smoked turkey. 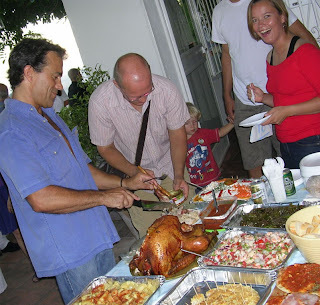 A Uruguayan friend, Eduardo, brought barbecued ribs, chicken wings, beef and sausage with knockout chimichurri sauce. Someone else brought wood-fired pizzas. Sharon, the clan’s matriarch, baked three different cakes. Cousins Luke, Karina and Jordi, all wearing the colors of Spain's world cup football champions, helped serve food and drinks. You will not need all of the yolks for this recipe. 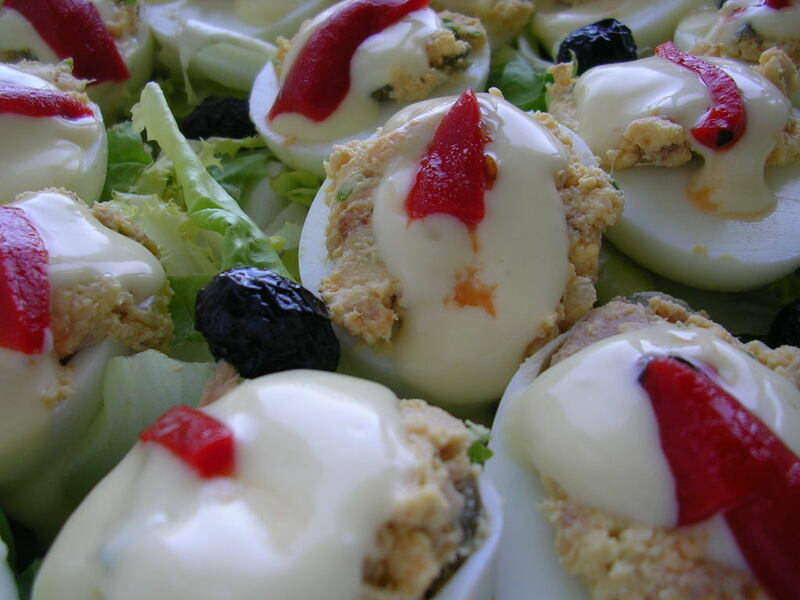 A few can be grated over the tops of the stuffed eggs. Save the remaining for another use. Peel the eggs and cut them in half lengthwise. Remove the yolks. Place six yolks in a bowl. Reserve the rest for another use. Add the tuna and its oil to the bowl with the yolks and mash them together. (If using shrimp, add it after the yolks are mashed along with 1 tablespoon of olive oil.) Add capers, onion, parsley, 3 tablespoons of the lemon juice, salt and pepper and pimentón and combine well. Spoon this mixture into the egg whites, smoothing the tops. In a small bowl, stir the mayonnaise with the olive oil and remaining 1 tablespoon of lemon juice until it reaches spreading consistency. If necessary, thin with a little water. Top each egg with a dollop of mayonnaise. 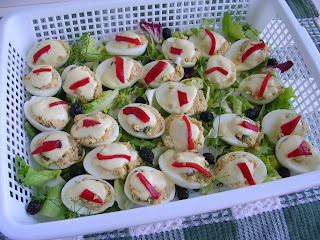 If desired, grate some of the reserved yolks over the stuffed eggs. 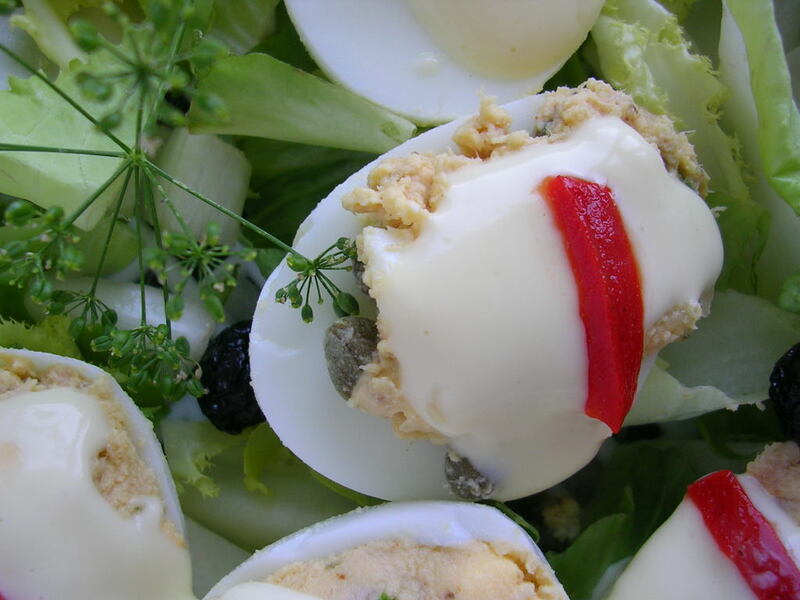 Lay a strip of red pimiento on top of each. Serve immediately or cover with plastic wrap and refrigerate until serving time. When my kids were growing up, come dinnertime, all I had to do was heat a little olive oil in a pan and add a chopped onion, gently frying it a few minutes, and the kids would materialize from the depths of homework or TV asking, "Smells great, what's for supper?" At which point, I could serve liver, fish brains, spinach or vetch and get away with it. Nothing, I think, tantalizes the taste buds like the smell of onions cooking. 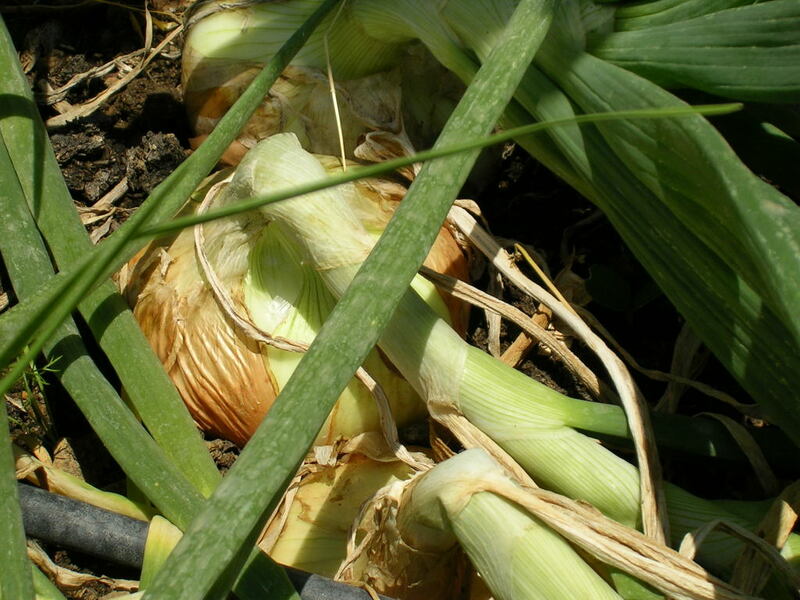 How could we cook in any language without that pungent member of the lily family, the onion? 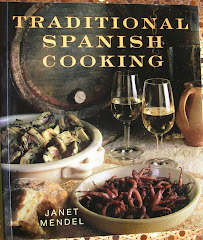 Certainly, Spanish cuisine would be bereft without it, for its flavor is essential to many dishes. 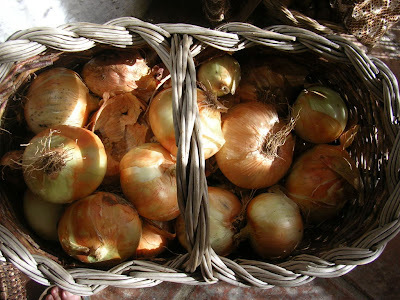 Onions are the basis for sofrito, a gently fried mixture that is the starting point for many traditional dishes. I am gloating over my new onion harvest—a basketful of big, golden onions that will last me several months. Stored in a cool, dry place, protected from light, they will keep until, in their natural cycle, they begin to sprout. Usually I have used them all up by then, but any that are sprouting can be replanted for an early crop of spring onions. The newly-harvested onions are nearly tear-free. Only when the sulphur compounds become more concentrated after storage does the job of chopping onions turn into a sob story. Parboiling onions for about 4 minutes before chopping will reduce the tear factor, as will chopping under running water. But, a good cry from time to time may well be one of the onion's endearing characteristics. I love to put sliced raw onions on toasted bread that has been drizzled with olive oil and topped with Manchego cheese. These fresh onions are remarkably sweet, without the bite. If you want raw onions without the bite, soak them in milk or salt water for an hour; drain and rinse before incorporating in a garnish or salad. Gentle cooking radically subdues the pungent, sulphurous quality of raw onions and causes their natural sugars to caramelize, adding a lovely colour and a slightly sweet taste. Be careful not to scorch them or they will turn bitter. 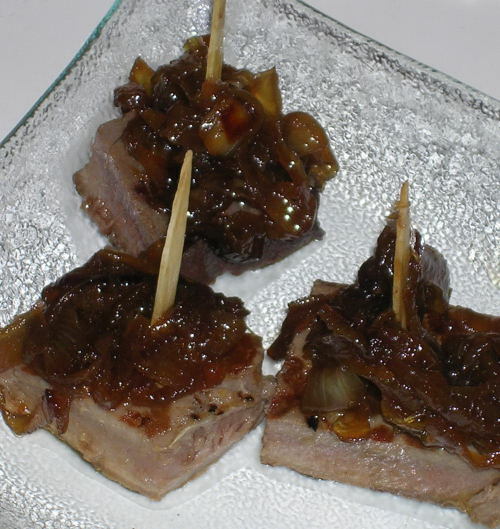 Use onion skins, slowly browned, simmered and strained, to add depth of colour to stocks and sauces. To make peeling onions easier, submerge briefly in boiling water or char over a gas flame or under the broiler. Raw herbs and greens, especially parsley, are said to diminish the onion's lingering on one's breath; salt and lemon help to eradicate it from hands and pans. 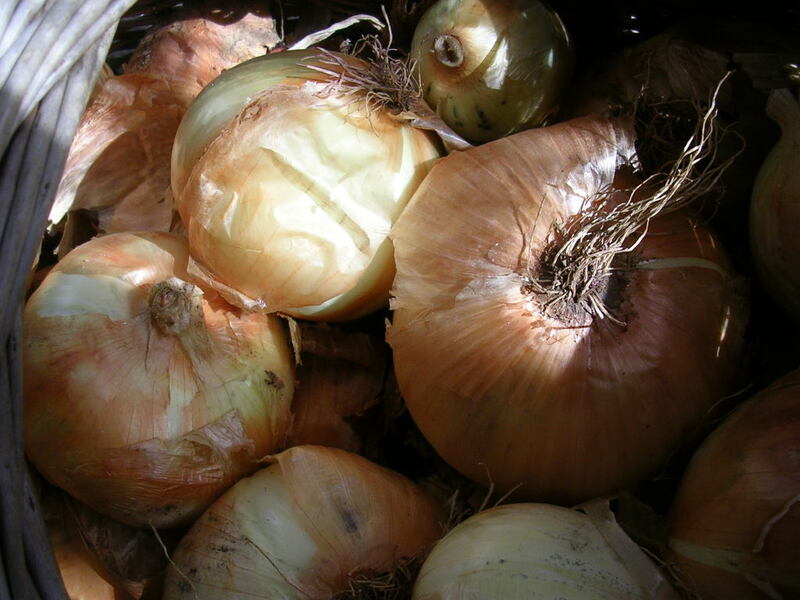 While onions generally make up the supporting cast, in this recipe they have a starring role. Grilled tuna with onion confit. Both in Andalusia and in the Basque Country, atún encebollado is a favorite dish. It consists of tuna braised with lots and lots of onions. This is a modernized version. The tuna is flash-cooked on a grill-pan and served with a deeply flavorful onion sauce. You should get to know Don Pedro Ximénez, aka PX. The sweet wines made from this grape varietal add alluring caramel and figgy flavours to sauces. 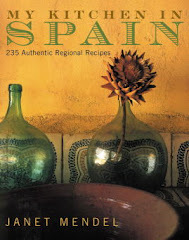 If you can´t find PX wine, use a medium Málaga Muscatel or oloroso Sherry. Cut the grilled tuna into squares to serve as a tapa or slice it for a dinner portion. 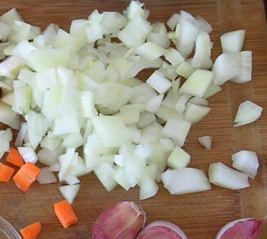 Cut the onions in half, then slice them thinly crosswise. Heat the oil in a frying pan and add the onions and garlic. Cook very slowly, stirring frequently, until onions are dark brown, 40 minutes. Do not let them scorch. Use a sharp knife to remove and discard skin and dark section of tuna meat. 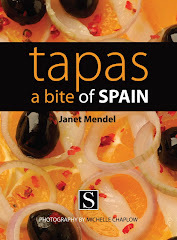 For tapas, cut into 10 squares, approximately 1 ½ inch. Stick each piece on a pick and spoon over the onion confit. Serve warm or room temperature. I’m home! 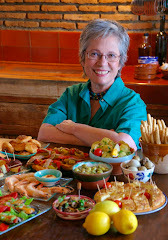 After several weeks visiting friends and family in the United States, I am back in my kitchen in Spain. Picking lemons, inspecting the ripening tomatoes, gloating over the onion harvest, pouring out my own olive oil, I am glad to be here. But I am remembering some wonderful food that I ate in the US, from New York to Atlanta to New Orleans. Let me share some of the flavors of my travels. Coming in to New York from the airport, I was amazed at how many trailer-trucks we passed hauling fresh eggs, milk, produce, meat. Caused me to think about what’s involved—growing, harvesting, packing, transporting, selling, cooking—in provisioning a city like New York. What a lot of food, day in and day out! My first New York taste (after friend Donna Gelb’s fregola and tuna salad) was of wood-fired, crisp crust pizza with grilled escarole salad at a neighborhood osteria. Satisfied, I took my jet-lagged self to bed. New herring, Grand Central Oyster Bar. The following day we walked, more than I have ever walked on pavement, I in thin-soled shoes. By evening, I had blisters on the bottoms of my feet. 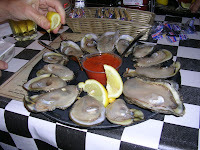 The lunch destination was Grand Central Oyster Bar (in Grand Central Station) for the June herring festival. We ate new herring, shipped in daily from the North Sea port in the Netherlands, simply served with a garnish of chopped egg and onion. 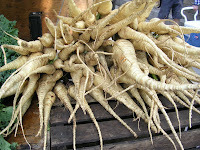 Parsnips at the Union Square Greenmarket. Shopping for food in New York was a delight. Such variety! One day we trekked to the Union Square Greenmarket, an open-air farmers’ market right in the bustling city. Farmers, bakers and artisan food producers show their wares in 140 stalls. Shopping for ingredients to make paella (see that story here), we stopped in Citarella, a store that started as a small neighborhood seafood market and became a top food destination. We got peeled shrimp plus some with heads-on, mussels and squid for the paella, then were tempted by soft-shell crabs, which I had never eaten before, and bluefish, fished from local waters. 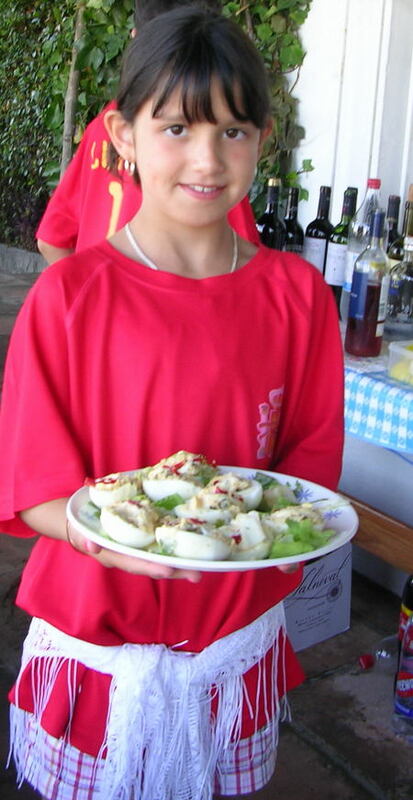 At home, Donna dusted the soft-shell crabs, a seasonal delicacy, with flour and pan-fried them. We ate them in their entirety, the shells a delicious crunch, with a sauce of roasted tomatoes. I could have eaten a few more! 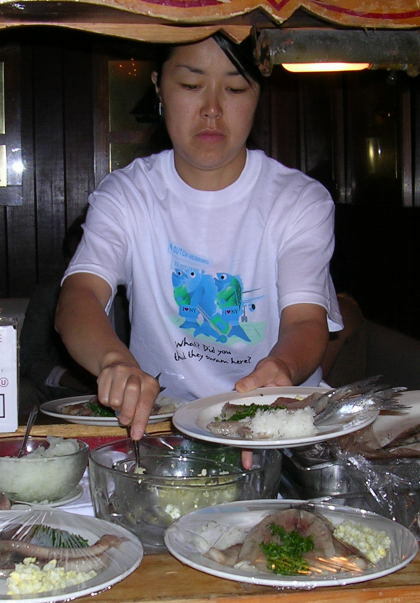 Bluefish, which Donna admitted to having ignored, she broiled with a little mustard. It was succulent, tasty. Loved it. 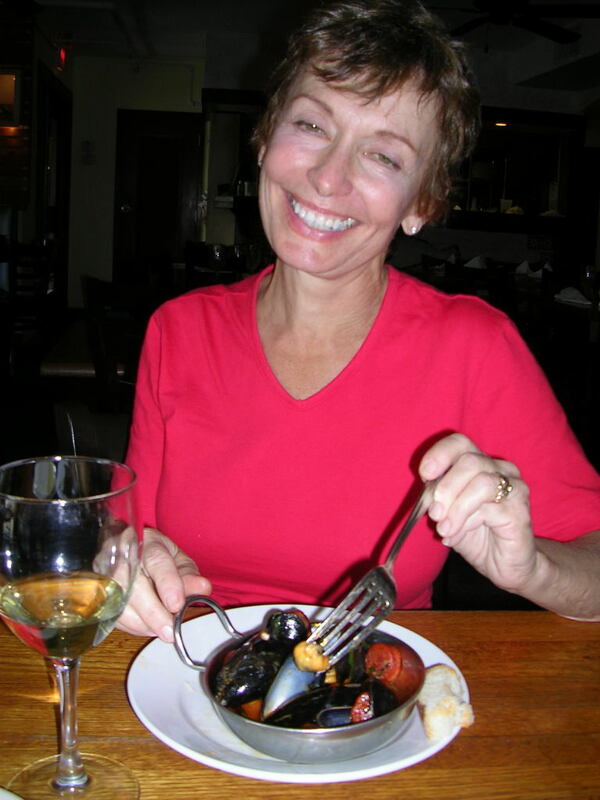 In Donna’s neighborhood is another famous food shop, Zabar’s, a deli plus everything. We picked up nova smoked salmon and freshly-baked bagels for breakfast. What a treat! These New York bagels with a poppy-seed topping are nothing like the sweet bagels you buy in supermarkets. Like Proust, I nearly swooned with food memories from long ago. The New York meal I never got (we cancelled a dinner reservation) was sushi. I did get a private screening of a sushi movie directed and produced by Donna’s son, David Gelb (www.sushimovie.com for a trailer). “Jiro Dreams of Sushi” is a documentary and biopic of Tokyo’s legendary Jiro Ono depicting the artistry, character and family drama of a modest (3-star) restaurant. The film will show at September’s San Sebastian (Spain) film festival. From cosmopolitan New York I flew to Atlanta to visit my son Daniel Searl, his wife Eli and my grandsons, Lucas 6, and Nico, 3. Daniel, who grew up in Spain and is bilingual, is director of Hispanic Student Development at The Westminster Schools in Atlanta. Eli (a tennis coach who works at an insurance company) is Venezuelan. At home they speak Spanish with the kids, who learn English at school. So, these kids, too, are growing up bilingual. The kids eat pizza and chicken nuggets, but also arepas (corn meal buns filled with cheese and meat) cooked at home by Eli. Lucas orders chicken-broccoli from Chinese take-out. Atlanta has a great place to shop, maybe the greatest I’ve seen anywhere in the US, because you can find just about anything you want there. It’s the Dekalb Farmers Market, just outside Atlanta. It’s not really a farmers’ market, in that by no means all is locally grown. It’s a huge warehouse building, chock-full of fresh produce, fresh fish and shellfish, meat, wine, cheese and dry staples. What’s impressive is the range of imported items. 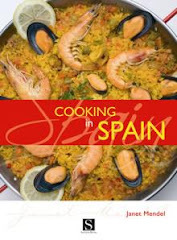 Here’s where we go to get real Spanish rice for paella, several brands of OLIVE OIL FROM SPAIN, wines from Spain. 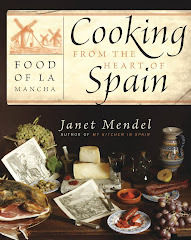 Or six types of rice from India; coffees from Guatemala; quinoa from wherever, amazing selection of spices and herbs. I love to chat with ethnic cooks, chefs, tourists, who throng the market. I buy stuff to bring back to Spain! My favorite meal while in Atlanta was steak grilled in the backyard (with a supermarket teriyaki marinade) with corn on the cob. Love the corn! I drizzle extra virgin olive oil on it. Daniel and Eli enjoy barbecued ribs at Fat Matt's. 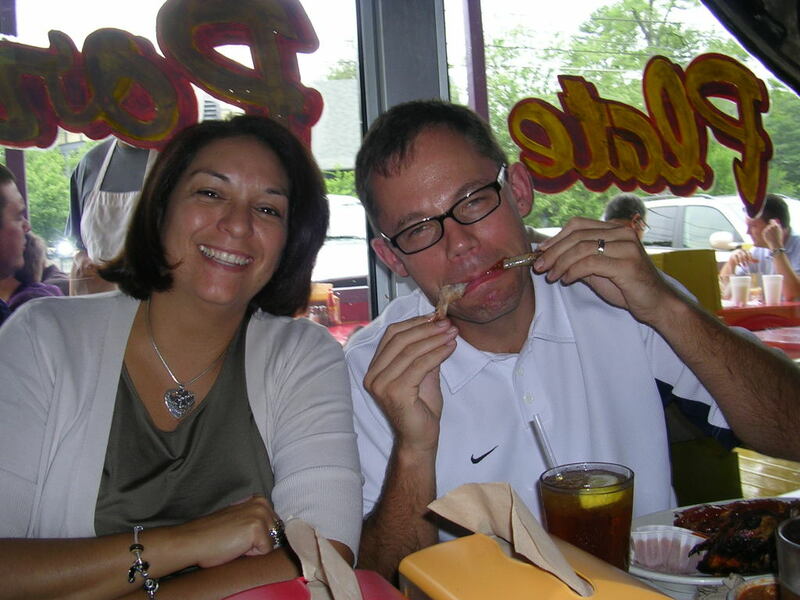 One lunchtime we all went to Fat Matt’s Rib Shack, for Atlanta-style barbecue. Delicious ribs, chicken and pulled pork with a sauce in perfect balance, a little hot, a little tangy, a little sweet. One of the side dishes was Brunswick stew, a Georgia favorite. I looked up the recipe and made this summer stew at home a few days later—chicken pieces dusted in flour and fried, then braised with tomatoes, corn and peppers. On to New Orleans. My sister, Elaine John, met me at the airport and we went straight to Drago’s in Metairie for a late-afternoon snack of fire-grilled oysters dusted with Parmesan. So good. 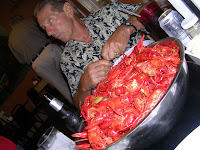 Later, husband VJ took us out to a local joint, The Boiling Pot, where three of us consumed 8 pounds of crawdads. You peel the crustaceans and eat the sweet-fleshed tails. Elaine and VJ outpaced me, but I must have consumed a couple pounds. Another evening, at a local joint, we started with a couple dozen oysters on the half-shell. We were told that Gulf oyster beds have gradually recuperated after, first Katrina, then the oil spill. 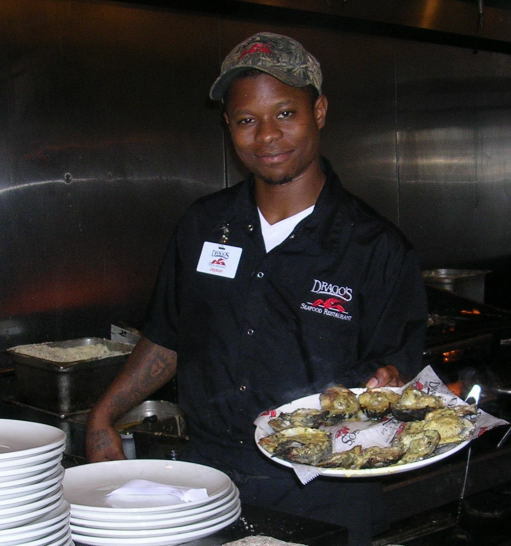 For a long time, Elaine said, New Orleans restaurants served oysters from elsewhere. Anybody can tell the difference, she said. The Gulf oysters are less briny than, for instance, those from the Pacific Northwest. I followed with “down-home” catfish, a freshwater fish, now farmed. Fried in a crunchy batter, it was juicy and served with the typical New Orleans “cocktail sauce,” tomato ketchup with a sinus-clearing dollop of horseradish. I laughed with pleasure as my eyes teared up. The side? hush puppies, nuggets of corn meal mush, deep-fried until crunchy. 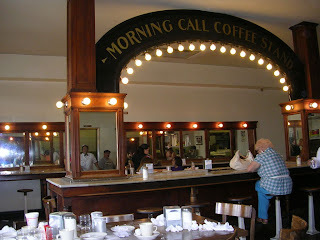 Morning Coffee, New Orleans Institution. On a day-trip into New Orleans (Elaine lives about 45 minutes away), we stopped for coffee at Morning Call, a New Orleans institution in Metairie and the French Quarter, for coffee with foamy milk and fried beignets. And, with all the restaurant options in New Orleans, where did we go for lunch? To a Spanish tapas bar, Rio Mar (800 South Peters), for fish in escabeche, really good mussels with chorizo and a couple glasses of Albariño wine. Mussels with chorizo, a Spanish dish. I had a long haul back to Spain—New Orleans to Atlanta to JFK, then a direct flight (Delta Airlines) to Málaga. On a two-hour layover in Atlanta, in order to avoid the food court, I wandered into a so-called sushi restaurant, One Flew South, and ordered, of all things, a hamburger! Grilled medium rare, with 5-spice fries, accompanied by a Spanish garnacha red wine, it was another great meal in America!